Since Ukrainian independence from the former USSR in 1991, the country has struggled to reclaim its identity and maintain some semblance of national independence from its former Soviet master. This is a struggle common to many of the former soviet republics and a situation made worse given the decades of forced population migrations, the suppression of indigenous cultures, and all the other issues which went along with the Russianization of occupied lands. Despite many people trying to oversimplify the situation - trying to suggest it is predominantly due to the gas pipelines that run through Ukraine, or the historical claims Russia has over Crimea - the tangled relationships within this region go back over a thousand years and have been made all the more complicated by the rise and fall of the Soviet Union. The recent crisis facing Ukraine and Crimea are at once distinct separate issues and part of a larger unified problem simultaneously. I will attempt to explain the history, reasons, and possible outcomes of this crisis. The first known organized and powerful Eastern Slavic state to arise was the Kievan Rus' federation of states whose capital was the city of Kiev (which had already existed as a major trading center for 300 years). The Kievan Rus' lasted over 400 years from 882 AD to 1283. The countries of Belarus, Russia, and Ukraine all claim Kievan Rus' as their heritage and cultural inheritance. At its height the various principalities stretched from the Black Sea in the south (including the territory of Crimea) to the White Sea in the far north, some 1,400 miles apart. After a period of decline and splintering, what was left of Kievan Rus' was finally conquered by Mongol invasions. Several of the remaining states slowly fell under the control of Moscow, but others, like the region surrounding Kiev and Crimea, became their own nations. Crimea was eventually subsumed into the Mongol "Golden Hord", but later gained a level of independence and became the longest surviving Khanate. The Crimean Khanate lasted from 1441 to 1783, and was primarily aligned with the Ottoman Empire. But over time, they too were slowly turned into Moscow's orbit, despite once invading and capturing Moscow themselves in 1571. Eventually, and after war, Crimea was incorporated into the Russian Empire in 1783 - the same fate befell much of Eastern Europe. Despite continued invasions, periods of peace & independence, and the ever shifting sands of empire, the people of the Crimea, as well as the wider Ukrainian territory, maintained their own unique and diverse cultures (including a sizable Muslim population). It is important to note that much of modern eastern Ukraine had actually been taken over by the Polish-Lithuanian Union. Let's skip forward to the Soviet Union. As we've seen, the Russian dominance of both Ukraine and Crimea is a relatively new event. 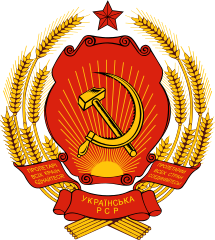 Ukraine was organized into the Ukrainian Soviet Socialist Republic in 1919 and Crimea was a territorial part of the Ukrainian SSR. During the early Soviet years (1922-1931), the original ideals of communism were actually beneficial to the region based on the concept of korenizatsiya (indigenization). This led to a revival of the Ukrainian language and culture. However, as Stalin began to implement harsher and more irrational agricultural programs the "Ukrainian Holocaust" (the Holodomor) eventually claimed the lives of 10 million Ukrainians. That, along with the costs of World War II (1.6 million Ukrainian troops killed), caused a severe depopulation of the region. The notorious purges of Stalin also meant the death or imprisonment of many leading figures of Ukrainian nationalism. By some estimates, 3/4ths of Ukraine's cultural elite, intellectuals, artists, etc. were killed or imprisoned. Korenizatsiya was ended and Russification began. Russification meant the harsh subjugation of all cultures, languages, and heritages of the many constituent Soviet "Republics" to that of Moscow and the authoritarian Russian way of life. During the post-war years, the Ukrainian SSR was actually granted special legal privileges. For example, while it was a fully integrated part of the Union of Soviet Socialist Republics, it was also allowed to join the United Nations as a semi-separate nation. During the remaining Soviet era, Ukraine became one of the USSR's primary military and scientific regions. But, thanks to Russification, the Ukrainian language was not taught as the primary language of the Ukrainian people and Ukrainian culture took a back seat to Russian culture. Over time this lead to two countries within one. The western parts of Ukraine still maintained a somewhat separate identity, but the east (and Crimea) became more and more Russianized. The effects of this can still be seen today. As the USSR began to crumble, over 300,000 Ukrainians protested in 1990 in Kiev for Ukrainian independence. Then on Aug. 21, 1991, the Ukrainian parliament passed an act declaring the country independent and a later referendum was overwhelmingly passed by the people of Ukraine to become a free and sovereign nation. The national vote was 92.3% in favor, including a solid majority of the people living in Crimea. Tellingly, Ukraine was not a signatory to the Alma-Ata Protocol in Dec. 1991, which established the Commonwealth of Independent States (a brotherhood of former Soviet Republics), and even today it's not a full member of the CIS. After the collapse of the USSR, the new Russian Federation and Ukrainian Republic tried to maintain strong and friendly ties. After all, their histories have been interwoven for centuries. But there should be no mistake, Ukraine was and is a fully sovereign nation. In 1994 the US, Russia, UK, and Ukraine signed the "Budapest Memorandum on Security Assurances". The document assures the territorial integrity and sovereignty of Ukraine and the signatories agreed "to refrain from economic coercion designed to subordinate to their own interest the exercise by Ukraine of the rights inherent in its sovereignty and thus to secure advantages of any kind." This economic provision was also part of the Helsinki Accords. Over the years, there has been a great level of economic cooperation between the two countries, although, Ukraine has also tightened relations with the West and isn't a member of many of the Russian-led trade/cultural/inter-governmental associations which have been established since the fall of the USSR. Ukraine has been one of the primary transit points for the vast amounts of Russian oil & gas to reach the European Union (80% of Russian natural gas exported to the EU move through Ukraine). 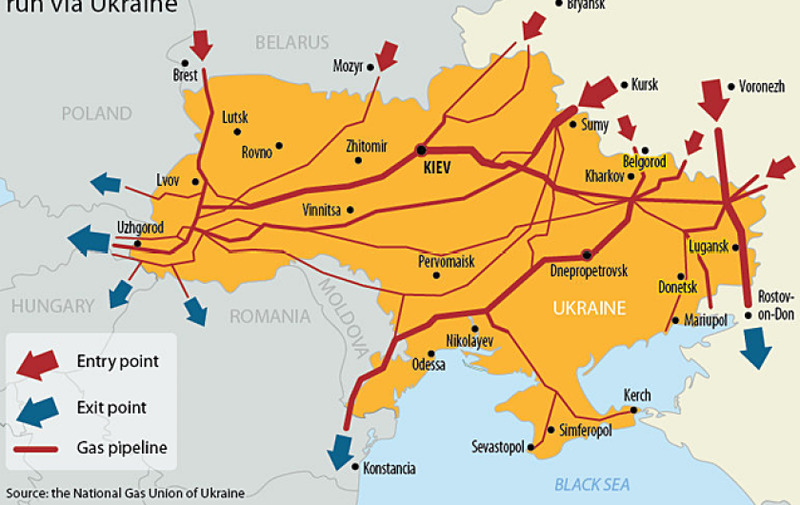 The issue of gas transportation has caused several disputes since the 1990s, and often it was Ukraine itself causing the problems. That being said, there is no real evidence that the issue of energy has played a leading role in the current crisis, which began in November 2013, and many of the pipelines themselves date to back to the Soviet era. Although, the value of the natural gas that Russia exports annually (all NG exports) is roughly $50-70 billion (export prices vary) plus a further $14 billion in other fees coming from Ukraine. So maintaining some level of control over the system is obviously a motivation to ensure Ukraine's allegiance. And now on to recent events. There remains a strong and evident division within Ukrainian society and a tug-of-war has existed since independence: on one side there are those who support closer ties to the West, membership in the European Union, and NATO inclusion. On the other side, are the substantial ethnic Russian minority who want to strengthen ties with Russia and remain solidly in the "Russosphere". 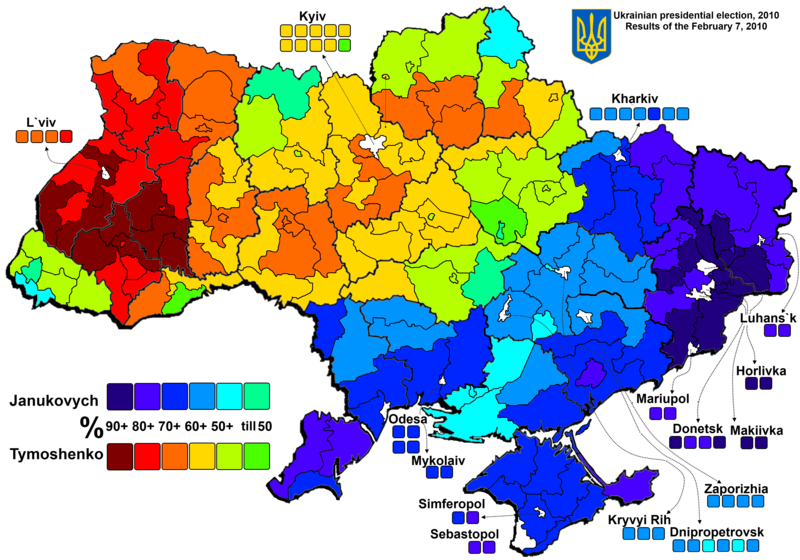 These divisions are most evident when you look at the country's 2010 presidential election and a map of the country when comparing predominately Russian vs. Ukrainian language speakers. The results of the election show a clear division within the country. Those who supported Yulia Tymoshenko are shown in red & yellow, and those who voted for Viktor Yanukovych are shown in blues. Yanukovych won the election by a 3.5% margin and his "Party of Regions" has a strong history of pro-Russian support. However, the Party of Regions' primary demographic base of support are with those who grew up during the Soviet period. Tymoshenko's "Fatherland" party is pro-European Union. Despite the victory of PoR, the overriding popular desire was to improve ties with the EU and, in time, become a full EU member. The map below shows the country divided along city/village councils and shows which language is spoken by a majority of the people. In order to become an EU member, Ukraine had to undergo several major reforms and Yanukovych had initially been in favor of fulfilling the obligations and acceding to the EU. Both the EU and Russia offered various loans and economic assistance to try and win support for their own particular causes, though Russia's economic support was much greater than the EU was willing to provide. And, Russia wasn't demanding that Ukraine root out corruption and take the necessary measures to bring their financial system into stricter alignment with international norms as the EU had demanded. After winning the election, Yanukovych's government also signed a controversial agreement renewing a lease for a military base in Sevastapol (the largest city in Crimea) to Russia until 2042 in exchange for better energy prices. The agreement was an extension of a similar treaty signed in 1997. The 1997 treaty was part of a military division agreement to help deal with the question of the old Soviet bases & military units left within Ukraine. It needs to be said that the 2010 naval treaty does not give the Russian military the authority to leave their bases, let alone run over the entire peninsula which is slightly larger than the US state of Vermont. It also seems to violate the national constitution's provision on hosting foreign bases. In November 2014, the government suspended their preparations for a free trade agreement with the EU and the plan to proceed with the signing of the EU Association Agreement. This was done after the government agreed to further these objectives which were a major factor in Yanukovych winning the election 2010. Thus, Euromaidan began. Since then there have been nation-wide protests involving hundreds of thousands of people (at times upward of a million), most notably in Kiev. Because of the enormous opposition, Yanukovych was ousted from power with the support of 73% of Ukraine's parliament. It was at this point that unmarked men in military garb and carrying weapons started appearing in Crimea. The Geneva Convention explicitly forbids this type of action. Then Russia's president, Vladimir Putin, said that they were only there to protect the Russian speaking people from dangerous mobs, though I haven't found any evidence of large scale violence or threats against anyone in Crimea (he also later claimed there were no troops at all there). From there, a steady stream of marked and unmarked Russian troops began taking over parts of Crimea, preventing Ukrainian soldiers from entering their own bases, and, eventually ended up taking over the entire peninsula. Such actions by Russia violate the UN Charter. 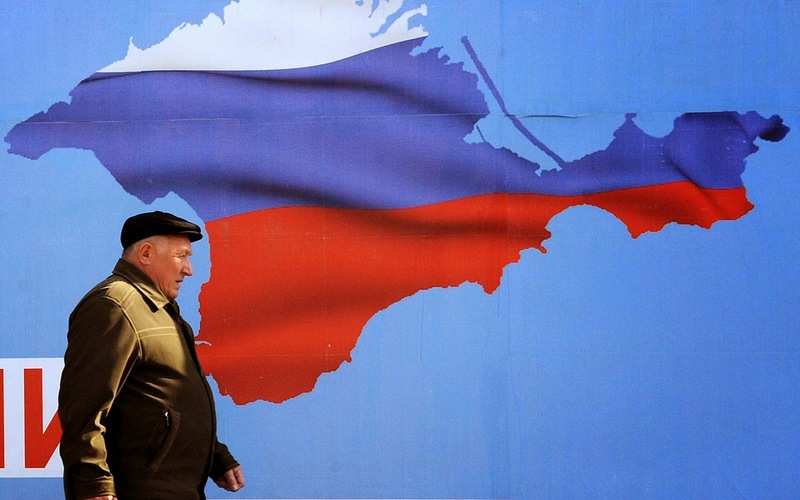 On March 11, the Supreme Councils of Crimea and Sevastopol (which is its own separate political entity) issued a joint "Declaration of Independence" which also laid out their intentions to hold a referendum to allow the people of Crimea to decide the question of secession. The concept of unilateral independence is a very controversial one in international law and most cases result in some kind of war. The international norm is that each party (parent country and separatist region) sits down and negotiates the terms of independence, often with international mediation. The legality of unilateral separation can be addressed by the Constitution of Ukraine. Article 17 of the Ukrainian constitution mentions the "territorial indivisibility of Ukraine" and prohibits any "armed formations not envisaged by law". Article 73 states: "Issues of altering the territory of Ukraine are resolved exclusively by an All-Ukrainian referendum." 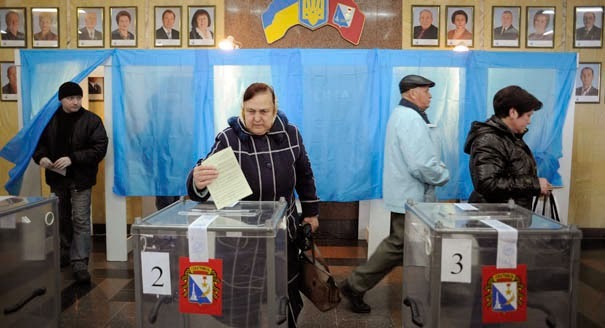 An "All-Ukrainian referendum" can be called for by popular initiative, however the initiative must be supported by no less than 3 million citizens. The population of Crimea is only 1.9 million - and of those approx. 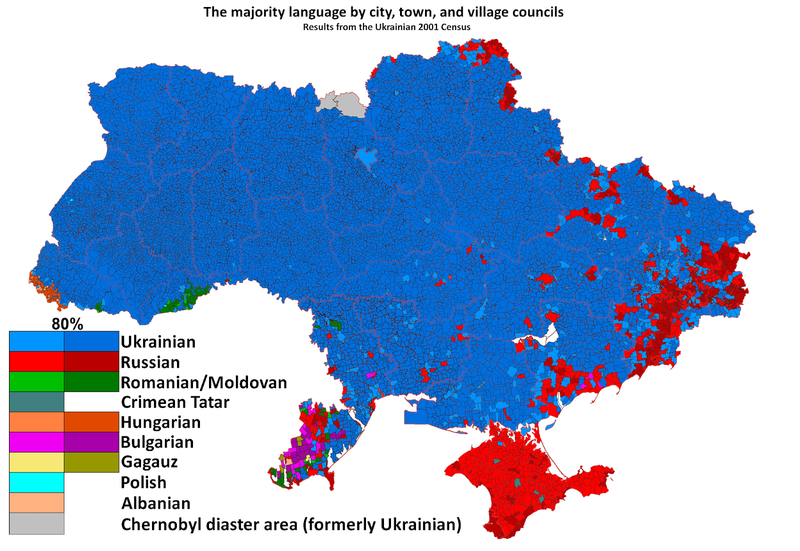 500,000 are ethnically Ukrainian. Furthermore, the initiative must have at least 100,000 signatures from each of Ukraine's 25 political divisions. Such an initiative must then be approved by the Verkhova Rada (Ukraine's supreme council or parliament). Article 85 also makes it clear that the autonomous powers of Crimea (and whatever laws passed) are subject to the approval of the national parliament. Chapters IX and X deal exclusively with Crimea and in case there was any doubt, explicitly states that Crimea is an inseparable part of Ukraine. The constitution was agreed upon by the people of Crimea. On the issue of dual citizenship, it is true that there are dual citizens within Ukraine (as with most countries), but, the law itself does not recognize dual citizenship. A person who holds dual citizenship while within the territory of Ukraine are considered only a citizen of Ukraine. The referendum has been criticized by several members of the Party of Regions and by the Crimean Tartar ethnic minority who make up 12% of Crimea's population. The Tartars had made up nearly 36% of Crimea's population prior to being forcibly deported by the Soviet Union. Prior to the actual referendum in Crimea, the leadership of three additional oblasts (provinces), which have a substantial Russian speaking population, stated their interests in having a similar vote and joining Russia as well. The map below shows Crimea in dark red, the three "supportive" oblasts are in light red. There are two other Russian-speaking majority oblasts in Ukraine as well which actually share a border with Russia. Continued unrest could lead to the fracturing of those oblasts and potentially a civil war, either low intensity or otherwise. Such violence may cause Russia to move their troops stationed along the Ukrainian border into the country under the guise of "protecting" ethnic Russians, despite the fact that it is the ethnic Russians themselves causing the problem. Given the continual movements of Russian troops and Russia's past involvement in Georgia, one can only speculate that if the people of these areas showed any kind of support for joining Russia, that Putin would try to "reclaim" these areas. There are several ways by which Russia can exert control over the old Soviet territories (or as some have suggested an attempt to reclaim the old Russian Empire). There is direct invasion/annexation which would clearly be a violation of international law, there is economic annexation (simply controlling the economies of the areas), and there's de facto annexation - such as the case with Abkhazi in Georgia, which also contained a large naval port. De facto annexation means that Russia nominally controls the territory and extends a military defensive shield while not having legitimate control (with the territory still being claimed by its parent nation) and not being recognized by the international community. What I find curious is that Russia is more than willing to support illegal referendums being held, to accept their results, and to work to gain new territory, but will ignore attempts at sovereignty movements within Russia's borders and will even engage in violent military actions to suppress such attempts. As the referendum votes were counted it became clear that the referendum would pass. But, as I've shown, the referendum itself is not legitimate. And while a 95% approval vote may sound convincing, it's important to remember that it's not 95% of Crimea's population, but only 95% of those who've vote; remembering that a sizable number of native Crimean's have rejected the entire process itself. And most damning, the questions on the referendum did NOT include a direct option to vote against joining Russia! Instead, the "dissenting" option was actually two questions in one: to revert the Crimean Constitution back to an older 1992 version (which Crimea alone has no power to do either) and remain part of Ukraine. The second option carries with it an additional complication. Not only were there were two constitutions passed in 1992, but the option doesn't actually prevent the general government of Crimea itself from seeking to join Russia. There have been comparisons with America's secession from Great Britain during the American Revolution. However, the comparison is flawed because it assumes that the Ukrainian government would not allow Crimea's independence at all. Crimea, while having a close history with the rest of Ukraine also has a strong history of attempting to be independent itself. Ukraine isn't in a position to forcibly keep Crimea apart of it. The problem has never been that Crimea shouldn't become independent and join Russia if they desired to, but that Russia itself took the opportunity to aggravate a tense nation-wide crisis by stoking pro-Russian regional dissent and then forcing the matter of independence at the point of a gun - possibly precluding any chance of peaceful, lawful, and amicable separation. 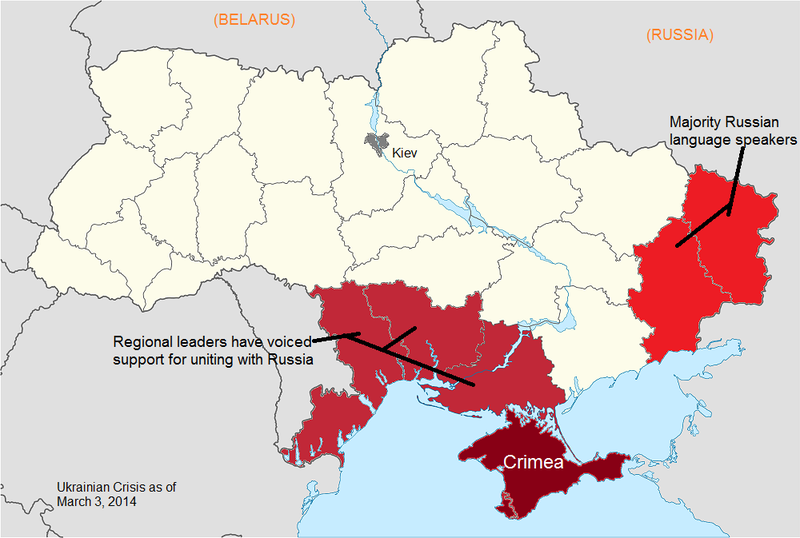 There are three main possible outcomes: military conflict, allowing secession, or refusing secession but granting a greater level of autonomy to Crimea which could eventually result in independence. Russia's military along with pro-Russian militias not only occupy Crimea, but also have thousands of troops (accompanied by tanks and aircraft) stationed on Ukraine's border and have recently moved troops out of Crimea and into other areas deeper within Ukraine. At the same time, Ukraine has mobilized its military and has called up tens of thousands of reserve personnel. As the crisis has evolved there have been instances of violence between protesters and members of the militias, this could easily spark a wider conflict. Unfortunately, Ukraine alone would lose a war against Russian conquest and there would be little the international community could really do. Sanctions against Russia would have a minor effect on its economy. The EU, and their substantial dependence on Russian energy, isn't in a position to engage in full scale sanctions. And even if they attempted them, Russia could easily sanction the EU by cutting off gas supplies. Even with the US, Russia could sanction America, and though we wouldn't really be hurt by it, the resulting American push back could cause greater and greater rounds of pressure (Russia vs US, US vs Russia, in a spiral). Crimea is already an autonomous republic which gives them a greater level of freedom, especially regarding culture, education, and the management of property (though not total control and not independence). I have little doubt that if Ukraine were to be left alone that there would be an independent Crimea. There could be a greater level of devolution, similar to the relationship of Scotland and the UK, and the Crimeans would be more than capable of joining the Unrepresented Peoples and Nations Organization (UNPO) which has had a good track record of helping separatist regions gain full independence. And they may even be granted observer status by the UN itself fairly quickly. Then, after independence, they could petition to join the Russian Federation if they so desired. As I have said, the biggest problem with this whole issue is that it is being decided by outside forces at the point of a gun. The sovereignty and integrity of not only Ukraine, but the Crimean people themselves, is being violated. Given the history of this region, and the fact that more often than not the affairs of Crimea & Ukraine have been dictated to them, I cannot see how this referendum or Russia's involvement could possibly be considered fair or just.